Alzheimer’s disease and Parkinson’s disease are both neurodegenerative disorders characterized by loss of nervous system functioning. Neural death is the main cause behind neurodegenerative disorders. Symptoms of neurodegenerative disorders usually depend on the area within the nervous system where neuron deaths take place. Alzheimer’s disease, characterized by severe dementia, can appear in the form of disruptive memory loss, confusion, difficulty planning or executing tasks, poor judgement, and personality changes. A decrease in the activity of cholinergic neurons is commonly seen in patients with Alzheimer’s disease. In Parkinson’s disease, the loss of dopamine neurons results in symptoms that include tremors, slowed movement, speech changes, balance and posture problems, and rigid muscles. Neither Alzheimer’s nor Parkinson’s disease have cures, but there are drug treatments available to control symptoms. Neurodegenerative disorders are illnesses characterized by a loss of nervous system functioning that are usually caused by neuronal death. These diseases generally worsen over time as more and more neurons die. The symptoms of a particular neurodegenerative disease are related to where in the nervous system the death of neurons occurs. Spinocerebellar ataxia, for example, leads to neuronal death in the cerebellum. The death of these neurons causes problems in balance and walking. Neurodegenerative disorders include Huntington’s disease, amyotrophic lateral sclerosis (ALS), Alzheimer’s disease, other dementia disorders, and Parkinson’s disease. In this section, Alzheimer’s and Parkinson’s disease will be discussed in more depth. Alzheimer’s disease is the most common cause of dementia in the elderly. In 2012, an estimated 5.4 million Americans suffered from Alzheimer’s disease. Payments for their care are estimated at $200 billion. Roughly one in every eight people age 65 or older has the disease. Due to the aging of the baby-boomer generation, there are projected to be as many as 13 million Alzheimer’s patients in the United States in the year 2050. Symptoms of Alzheimer’s disease include disruptive memory loss, confusion about time or place, difficulty planning or executing tasks, poor judgement, and personality changes. Problems smelling certain scents can also be indicative of Alzheimer’s disease and may serve as an early warning sign. Many of these symptoms are also common in people who are aging normally, so it is the severity and longevity of the symptoms that determine whether a person is suffering from Alzheimer’s. Alzheimer’s disease was named for Alois Alzheimer, a German psychiatrist who published a report in 1911 about a woman who showed severe dementia symptoms. Along with his colleagues, he examined the woman’s brain following her death and reported the presence of abnormal clumps, which are now called amyloid plaques, along with tangled brain fibers called neurofibrillary tangles. Amyloid plaques, neurofibrillary tangles, and an overall shrinking of brain volume are commonly seen in the brains of Alzheimer’s patients. Loss of neurons in the hippocampus is especially severe in advanced Alzheimer’s patients. Many research groups are examining the causes of these hallmarks of the disease. Alzheimer’s disease: Compared to a normal brain (left), the brain from a patient with Alzheimer’s disease (right) shows a dramatic neurodegeneration, particularly within the ventricles and hippocampus. One form of the disease is usually caused by mutations in one of three known genes. This rare form of early-onset Alzheimer’s disease affects fewer than five percent of patients with the disease and causes dementia beginning between the ages of 30 and 60. The more prevalent, late-onset form of the disease probably also has a genetic component. One particular gene, apolipoprotein E (APOE) has a variant (E4) that increases a carrier ‘s probability of developing the disease. Many other genes have been identified that may be involved in the pathology. Unfortunately, there is no cure for Alzheimer’s disease. Current treatments focus on managing the symptoms of the disease. Because decrease in the activity of cholinergic neurons (neurons that use the neurotransmitter acetylcholine ) is common in Alzheimer’s disease, several drugs used to treat the disease work by increasing acetylcholine neurotransmission, often by inhibiting the enzyme that breaks down acetylcholine in the synaptic cleft. Other clinical interventions focus on behavioral therapies such as psychotherapy, sensory therapy, and cognitive exercises. Since Alzheimer’s disease appears to hijack the normal aging process, research into prevention is prevalent. Parkinson’s disease is also a neurodegenerative disease. It was first characterized by James Parkinson in 1817. Each year, 50,000-60,000 people in the United States are diagnosed with the disease. Parkinson’s disease causes the loss of dopamine neurons in the substantia nigra, a midbrain structure that regulates movement. Loss of these neurons causes many symptoms including tremor (shaking of fingers or a limb), slowed movement, speech changes, balance and posture problems, and rigid muscles. The combination of these symptoms often causes a characteristic slow, hunched, shuffling walk. Patients with Parkinson’s disease can also exhibit psychological symptoms, such as dementia or emotional problems. 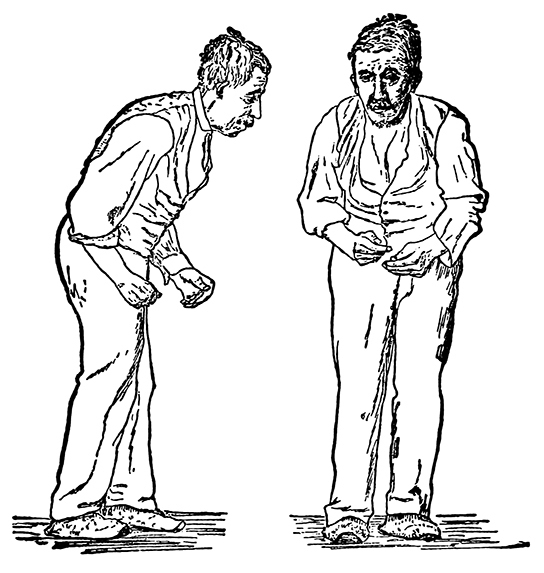 Parkinson’s disease: Parkinson’s patients often have a characteristic hunched walk. The disease is likely the result of a combination of genetic and environmental factors. Although some patients have a form of the disease known to be caused by a single mutation, for most patients, the exact causes of Parkinson’s disease remain unknown. The disease probably results from a combination of genetic and environmental factors, similar to Alzheimer’s disease. Post-mortem analysis of brains from Parkinson’s patients shows the presence of Lewy bodies, abnormal protein clumps, in dopaminergic neurons. The prevalence of these Lewy bodies often correlates with the severity of the disease. There is no cure for Parkinson’s disease; treatment is focused on easing symptoms. One of the most-commonly prescribed drugs for Parkinson’s is L-DOPA, which is a chemical that is converted into dopamine by neurons in the brain. This conversion increases the overall level of dopamine neurotransmission and can help compensate for the loss of dopaminergic neurons in the substantia nigra. Other drugs work by inhibiting the enzyme that breaks down dopamine. Autism and ADHD are neurodevelopmental disorders that arise when nervous system development is disrupted. Disturbances in the development of the nervous system, genetic or environmental, may lead to neurodevelopmental diseases. Individuals affected by autism are believed to have one of many different mutations in genes required for the disease to cause disruptions in the nervous system that are generally observed; however, studies on specifics are still inconclusive. In ADHD, a strong genetic component may contribute to the disorder; however, no definitive links have been found. Individuals with ADHD may experience other psychological or neurological disorders in addition to their ADHD symptoms; this experience of having more than one disorder is termed comorbidity. The cause of both autism and ADHD are unknown and cures are unavailable; however, treatments to alleviate symptoms are accessible. Neurodevelopmental disorders occur when the development of the nervous system is disturbed. There are several different classes of neurodevelopmental disorders. Some, like Down Syndrome, cause intellectual deficits, while others specifically affect communication, learning, or the motor system. Some disorders, such as autism spectrum disorder and attention deficit/hyperactivity disorder, have complex symptoms. Autism spectrum disorder (ASD, sometimes just “autism”) is a neurodevelopmental disorder in which severity differs from person to person. Estimates for the prevalence of the disorder have changed rapidly in the past few decades. Current estimates suggest that one in 88 children will develop the disorder. ASD is four times more prevalent in males than females. A characteristic symptom of ASD is impaired social skills. Children with autism may have difficulty making and maintaining eye contact and reading social cues. They also may have problems feeling empathy for others. Other symptoms of ASD include repetitive motor behaviors (such as rocking back and forth), preoccupation with specific subjects, strict adherence to certain rituals, and unusual language use. Up to 30 percent of patients with ASD develop epilepsy. Patients with some forms of the disorder (e.g., Fragile X syndrome) also have intellectual disability. Because it is a spectrum disorder, other ASD patients are very functional and have good-to-excellent language skills. Many of these patients do not feel that they suffer from a disorder and instead just believe that they process information differently. Except for some well-characterized, clearly-genetic forms of autism (e.g., Fragile X and Rett Syndrome), the causes of ASD are largely unknown. Variants of several genes correlate with the presence of ASD, but for any given patient, many different mutations in different genes may be required for the disease to develop. At a general level, ASD is thought to be a disease of “incorrect” wiring. Accordingly, brains of some ASD patients lack the same level of synaptic pruning that occurs in non-affected people. There has been some unsubstantiated controversy linking vaccinations and autism. In the 1990s, a research paper linked autism to a common vaccine given to children. This paper was retracted when it was discovered that the author falsified data; follow-up studies showed no connection between vaccines and autism. Treatment for autism usually combines behavioral therapies and interventions, along with medications to treat other disorders common to people with autism ( depression, anxiety, obsessive compulsive disorder). Although early interventions can help mitigate the effects of the disease, there is currently no cure for ASD. Approximately three to five percent of children and adults are affected by attention deficit/hyperactivity disorder (ADHD). Like ASD, ADHD is more prevalent in males than females. Symptoms of the disorder include inattention (lack of focus), executive functioning difficulties, impulsivity, and hyperactivity beyond what is characteristic of the normal developmental stage. Some patients do not have the hyperactive component of symptoms and are diagnosed with a subtype of ADHD: attention deficit disorder (ADD). Many people with ADHD also show comorbidity: they develop secondary disorders in addition to ADHD. Examples include depression or obsessive compulsive disorder (OCD). Comorbidity with ADHD: Many people with ADHD have one or more other psychological or neurological disorders. The cause of ADHD is unknown, although research points to a delay and dysfunction in the development of the prefrontal cortex and disturbances in neurotransmission. According to some twin studies, the disorder has a strong genetic component. There are several candidate genes that may contribute to the disorder, but no definitive links have been discovered. Environmental factors, including exposure to certain pesticides, may also contribute to the development of ADHD in some patients. Treatment for ADHD often involves behavioral therapies and the prescription of stimulant medications, which, paradoxically, cause a calming effect in these patients. Schizophrenia and depression are just two examples of mental illnesses caused by a disorder of the nervous system. Complications with thinking, mood, or problems relating to other people are issues that are commonly associated with those affected with neurodevelopmental disorders. Malfunctioning dopaminergic neurons and problems with glutamate signaling are thought to be potential causes of schizophrenia. Although no definitive answer yet exists, genetic and environmental risk factors are believed to be the main causes of depression. Exact cures do not exist for either schizophrenia or depression; however, schizophrenia may be treated with anti-psychotic medications while depression treatments include psychotherapy, electroconvulsive therapy, deep-brain stimulation, and prescription medications. serotonin: an indoleamine neurotransmitter that is involved in depression, appetite, etc., and is crucial in maintaining a sense of well-being, security, etc. Mental illnesses are nervous system disorders that result in problems with thinking, mood, or relating with other people. These disorders are severe enough to affect a person’s quality of life and often make it difficult for people to perform the routine tasks of daily living. Debilitating mental disorders plague approximately 12.5 million Americans (about 1 in 17 people) at an annual cost of more than $300 billion. There are several types of mental disorders including schizophrenia, major depression, bipolar disorder, anxiety disorders, post-traumatic stress disorder, and many others. The American Psychiatric Association publishes the Diagnostic and Statistical Manual of Mental Disorders (or DSM), which describes the symptoms required for a patient to be diagnosed with a particular mental disorder. Each newly-released version of the DSM contains different symptoms and classifications as researchers learn more about these disorders, their causes, and how they relate to each other. A more detailed discussion of two mental illnesses, schizophrenia and major depression, is given below. Schizophrenia is a serious and often-debilitating mental illness affecting one percent of the population in the United States. Symptoms of the disease include the inability to differentiate between reality and imagination, inappropriate and unregulated emotional responses, difficulty thinking, and problems with social situations. Symptoms of schizophrenia may be characterized as either “negative” (deficit symptoms) or “positive”. Positive symptoms are those that most individuals do not normally experience, but are present in people with schizophrenia. They can include delusions, disordered thoughts and speech, and tactile, auditory, visual, olfactory and gustatory hallucinations, typically regarded as manifestations of psychosis. Negative symptoms are deficits of normal emotional responses or of other thought processes, and commonly include flat or blunted affect and emotion, poverty of speech, inability to experience pleasure, lack of desire to form relationships, and lack of motivation. Many schizophrenic patients are diagnosed in their late adolescence or early 20s. The development of schizophrenia is thought to involve malfunctioning dopaminergic neurons and may also involve problems with glutamate signaling. Treatment for the disease usually requires anti-psychotic medications that work by blocking dopamine receptors and decreasing dopamine neurotransmission in the brain. This decrease in dopamine can cause Parkinson’s disease-like symptoms in some patients. While some classes of anti-psychotics can be quite effective at treating the disease, they are not a cure; most patients must remain medicated for the rest of their lives. Schizophrenia: The development of schizophrenia is thought to be caused by malfunctioning dopaminergic neurons, which causes brain dysfunction and an imbalance of chemicals in the brain. Major depression (also referred to as just “depression” or “major depressive disorder”) affects approximately 6.7 percent of the adults in the United States each year and is one of the most common mental disorders. To be diagnosed with major depressive disorder, a person must have experienced a severely-depressed mood lasting longer than two weeks along with other symptoms that may include a loss of enjoyment in activities that were previously enjoyed, changes in appetite and sleep schedules, difficulty concentrating, feelings of worthlessness, and suicidal thoughts. The exact causes of major depression are unknown and probably include both genetic and environmental risk factors. Some research supports the “classic monoamine hypothesis,” which suggests that depression is caused by a decrease in norepinephrine and serotonin neurotransmission. One argument against this hypothesis is the fact that some antidepressant medications cause an increase in norepinephrine and serotonin release within a few hours of beginning treatment, but clinical results of these medications are not seen until weeks later. This has led to alternative hypotheses. For example, dopamine may also be decreased in depressed patients, or it may actually be an increase in norepinephrine and serotonin that causes the disease, and antidepressants force a feedback loop that decreases this release. Treatments for depression include psychotherapy, electroconvulsive therapy, deep-brain stimulation, and prescription medications. Most commonly, individuals undergo some combination of psychotherapy and medication. There are several classes of antidepressant medications that work through different mechanisms. For example, monoamine oxidase inhibitors (MAO inhibitors) block the enzyme that degrades many neurotransmitters (including dopamine, serotonin, norepinephrine), resulting in increased neurotransmitter in the synaptic cleft. Selective serotonin reuptake inhibitors (SSRIs) block the reuptake of serotonin into the presynaptic neuron. This blockage results in an increase in serotonin in the synaptic cleft. Other types of drugs, such as norepinephrine-dopamine reuptake inhibitors and norepinephrine-serotonin reuptake inhibitors, are also used to treat depression. Epilepsy and stroke are examples of neurological disorders that arise from malfunctions in the nervous system. Although all types of epilepsy are characterized by recurrent seizures, the disorder itself can be a symptom of various factors, both genetic and environmental; the specific causes of epilepsy remain to be identified. Neural death, caused by a lack of oxygen for a prolonged period of time, is the main cause of stroke. Anti-convulsant medications and brain removal surgery are treatments for epilepsy, while anti-clotting medication and physical therapy are used in the treatment of stroke. Anti-convulsant medications and brain removal surgery are treatments for epilepsy while anti-clotting medication and physical therapy are used in the treatment of stroke. There are several other neurological disorders that cannot be easily placed into clean-cut categories. These include chronic pain conditions, cancers of the nervous system, epilepsy disorders, and stroke. Epilepsy and stroke are discussed below. Estimates suggest that up to three percent of people in the United States will be diagnosed with epilepsy in their lifetime. While there are several different types of epilepsy, all are characterized by recurrent seizures. Epilepsy itself can be a symptom of a brain injury, disease, or other illness. For example, people who have intellectual disability or autism spectrum disorder can experience seizures, presumably because the developmental wiring malfunctions that caused their disorders also put them at risk for epilepsy. For many patients, however, the cause of their epilepsy is never identified and is probably a combination of genetic and environmental factors. Often, seizures can be controlled with anti-convulsant medications. However, for very severe cases, patients may undergo brain surgery to remove the brain area where seizures originate. A stroke results when blood fails to reach a portion of the brain for a long enough time to cause damage. Without the oxygen supplied by blood flow, neurons in this brain region die. This neuronal death can cause many different symptoms, depending on the brain area affected, including headache, muscle weakness or paralysis, speech disturbances, sensory problems, memory loss, and confusion. Stroke is often caused by blood clots, but can also be caused by the bursting of a weak blood vessel. Strokes are extremely common; they are the third most-common cause of death in the United States. On average one person experiences a stroke every 40 seconds in the United States. Approximately 75 percent of strokes occur in people older than 65. Risk factors for stroke include high blood pressure, diabetes, high cholesterol, and a family history of stroke. Smoking doubles the risk of stroke. Treatment following a stroke can include blood pressure medication (to prevent future strokes) and (sometimes intense) physical therapy. Stroke effects on the brain: A cerebral infarction, shaded in blue, occurs after a stroke when blood fails to reach a portion of the brain long enough to cause damage. The red arrow depicts the midline shift that occurs in the brain, which is also caused by a stroke.